Middle East is a map available for ground forces. It first appeared, temporarily, as a map for the 2017 April Fools event. A modified version was later released in Update 1.75 "La Résistance" as a map for ground forces battles. The map is set around a war-torn town in the Middle East; nearly every building on the map has received some damage, with many being largely destroyed. The map is set in modern times, with satellite dishes on the roofs of buildings and modern looking cars in the town. The north of map consists of an industrial complex with several damaged large buildings, and large oil tanks. In the middle of the complex there is an underground area, which provides cover from the air and enemy tanks. In order for enemy tanks to kill a player in this area they must drive down into it this situation heavily favours the defending player. The underground area is also often used as a capture point. Combat tends to take place a short - medium range; however hills and rocks in both the east and west of the map other a location for longer range engagements, providing strong positions for tanks to shoot down into the complex, or across the map at the enemy tanks on the opposing hill. A thick line of rocks to the north of the complex provides a route where players can advance, safe from enemy fire, and shoot at tanks on the hills; after that they can enter the complex and attack enemy players from unexpected angles. The south of the map consists of a heavily damaged, war-torn, town. Fightning usually takes place at short range around the buildings / in the streets; and there are plenty of places players can hide among the rubble to set up ambushes. Two underground sections, like the one in the north, provide a good opportunity for scout vehicles. They can sit in the sections and use their binoculars to spot enemy tanks, while not being visible to enemy tanks. The hills in the south provide a location to shoot down into the town, although is more limited than the locations in the north. A capture point is sometimes located at a fuel station in the south of the town. 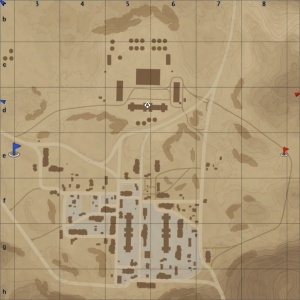 The north of the town starts to open up into the desert, and is visible to tanks in sniping positions in the northeast and northwest of the map. Paved roads provide quicker access to the industrial complex and the east / west of the map, but leave the player extremely exposed, so should usually be avoided. There is a military area in the north of the town, with a radio tower and watch tower, which is sometimes used as a capture zone. The tank battles map is 2km x 2km, restricted to 1.3km x 1.3km in battle. The air forces map is 65km x 65km. The map is referred to as "Syria" in the game files, heavily implying the map is set in / inspired by the country. There are three Capture Points. Point A is in the south of the town, B is in the north of the town, and C is in the industrial complex in the north. There are two capture points, each owned by one of the teams. The points are in the east and west of the town. This page was last edited on 7 March 2019, at 16:51.